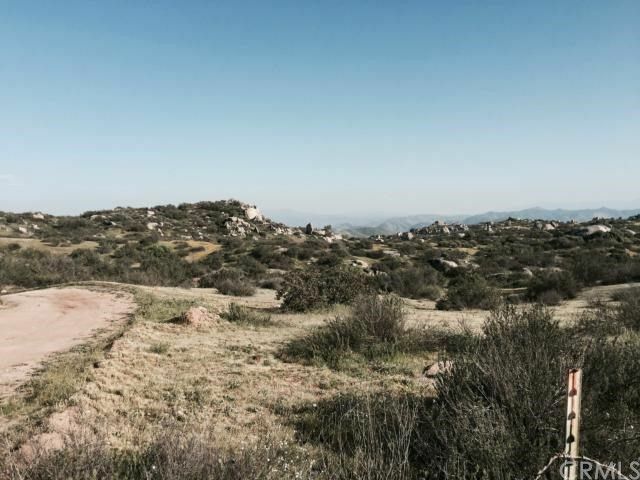 NINE (9.34) net ACRES of VIEW LAND in SOUTHWESTERN RIVERSIDE COUNTY! The fastest growing County in California. Parcel is located on the Southeast corner of Minton Road & La Huerta! Fabulous frontage of 866' along Minton Rd. Southern California Edison power poles run along La Huerta Rd. This insures you have road maintenance with easy access! Great property on dirt road for possible "OFF THE GRID" Choose to hook up or wait until progress comes closer to your lot. Possible propane, solar, wind, water tanks, well! Flat areas to build a custom or mobile home. Amazing rock-outcroppings & natural shrubs to enjoy the environment! Room for garages, sheds, out buildings, stables, barns. NO Home Owners Association RULES & regulations. Plenty of dirt trails for horses, walking, ATV's. Perris, Diamond & Elsinore lakes are just minutes away for fishing & boating! Minutes to services. shopping, schools, churches, parks, & restaurants. New AMTRAC! New development surrounds area. "The Villages of Lakeview" is bringing new subdivisions. commercial, new schools and parks. Larger parcels will be @ a premium & financially unavailable to the individual land buyer. Easy commute to the I-215, I-15, I-10, Hwy 74 & 79 & the Ramona Expressway, to LA, Orange, San Diego & San Bernardino Counties! BUILD or BUY and HOLD!